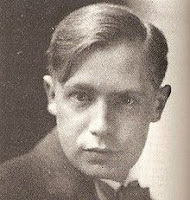 David Garnett (1892-1981) was the grandson of Richard Garnett (librarian at the British Museum and author of the wonderful fantasy collection The Twilight of the Gods, 1888). He was born in Brighton, and brought up near Edenbridge in Kent. As a child he had a coat made of rabbit skin, and thus earned the nickname Bunny, by which he was generally known. Through his father, an author and publisher, he met many authors, including Joseph Conrad, D.H. Lawrence and W.H. Hudson; with his mother Constance Garnett, a distinguished translator of Russian classics, he made a visit to Russia, in 1904. David was educated at University College School and at the Royal College of Science in South Kensington. He became associated with the Bloomsbury Group, having Virginia Woolf, Lytton Strachey, Maynard Keynes and others among his closest friends. He was bisexual: his male lovers included Francis Birrell and Duncan Grant. During the Great War he and Francis Birrell went to work with the Quakers in France, and then he and Duncan Grant petitioned for conscientious objector status together. For his Great War experiences, see here. Garnett wrote a number of fantasy novels, beginning with his first, Lady into Fox (1922), which imagined the metamorphosis of a Victorian woman into a vixen. She is eventually killed by hounds (which one may read as “patriarchal society”). H.G. Wells wrote a very favourable review in the Adelphi, saying that it was “perfectly done”: “It is like a small, queer furry animal, I admit, but as alive, as whimsically inevitable as a very healthy kitten. It shows up most other stories for the clockwork beasts they are” (quoted in Garnett, Flowers, 248). The book won the Hawthornden and James Tait Black literary prizes, and he was enabled to buy Hilton Hall, a seventeenth-century house near Huntingdon, and devote himself to writing. In 1939 he joined the RAF reserve and then became an intelligence officer. His wife Ray died in 1940, and in 1942 Garnett married Angelica Bell (the daughter of Clive and Vanessa Bell, of Bloomsbury fame). Garnett wrote around 35 other books, of which some of the later ones are also fantastical. Two by Two: A Story of Survival (1963) is a rewriting of the story of God drowning most of the human species; Ulterior Motives (1966) is about matter transmission. His last novel is a fantasy version of the Puss-in-Boots story: The Master Cat (1974). His book Aspects of Love was made into an Andrew Lloyd Webber musical in 1989, and Lady into Fox was produced as an opera (with music by Nicholas Bloomfield) in 1996. Garnett’s three-volume autobiography has the overall title of The Golden Echo. The first was The Golden Echo (London: Chatto and Windus, 1953), which ends with the outbreak of war in 1914; the second, The Flowers of the Forest (London: Chatto and Windus, 1955), ends with the publication of Lady into Fox and the birth of his son Richard in 1922. For comment on his fiction, see The Encyclopedia of Science Fiction. The Oxford Dictionary of National Biography entry on Garnett (volume 21, 2004) is written by Frances Partridge (1900-2004). Presumably because of her own close relationship to Garnett it is a strangely reticent account, not spelling out his conscientious objection, for instance, let alone his homosexual relationships. Frances Partridge was the youngest sister of Ray Marshall, who became Garnett’s first wife, and Frances herself worked in the bookshop owned by Garnett and Francis Birrell just after the First World War. Frances met her future husband Ralph Partridge when he was married to Carrington, who was in love with Lytton Strachey, who was in love with Ralph Partridge, who falls in love with Frances Marshall… (In the movie Carrington (1995), Frances Marshall was played by Alex Kingston.) Frances and Ralph married after Lytton’s death and Carrington’s suicide; their only child, Lytton Burgo Partridge, married Henrietta Garnett, the daughter of David and Angelica Garnett.